I watched Monday night, eager to take in the relaunching of the mysteriously beleaguered network Oprah and the Discovery Network have poured so much money, time, and angst into. The problem was that, while she had some good jokes, several of her references were to people we barely remember. Anyone under 40 might be clueless. Then her guest, Russell Brand was funny, but anyone over 40 was clueless: who IS this person? 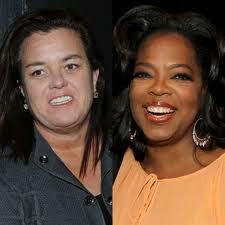 Rosie’s ratings were higher than Oprah’s, interestingly…perhaps the re-packaged shows are revealing their age? I’m sure this is much more than Oprah bargained for: the realization that “re-invention” might mean throwing out those thousands of hours of shows…and really re-inventing.Starting over. Thinking new. What a drag for a woman who has spent a lifetime living the media dream with astonishing success. As always, Oprah is singular…and I’m definitely rooting for her. Good observation. I think the lifeclass is fab, but many don’t seem to be watching. So, it may take some time to catch on but Oprah should keep going with her current lineup…at least until it catches on. Its much better than the orig OWN lineup, which was practically non-existent.